Today’s repost is an updated version of one I originally shared back in October of 2015 — and yes, I’m still using the tips and ideas in this post on a weekly basis! Whenever I walk into the grocery store, the very first place I go is to the discount produce racks. Sometimes, they are completely empty, but most of the time they are FILLED with produce that is just a day or so past the store’s sell-by date. This produce is most certainly still edible… and it’s usually 50% – 75% off regular price produce. UPDATE: Our local grocery store doesn’t have as many of these deals anymore — BUT, I still use the tips and ideas in this post to make sure we don’t waste any of our delicious produce! In the fall, I often get discounted “seconds” (produce that might have a few bruises or be mis-shaped, small, etc.) at orchards and other farmer’s markets for drastically reduced prices. I save SO much money buying discounted produce, and it rarely ever goes to waste. 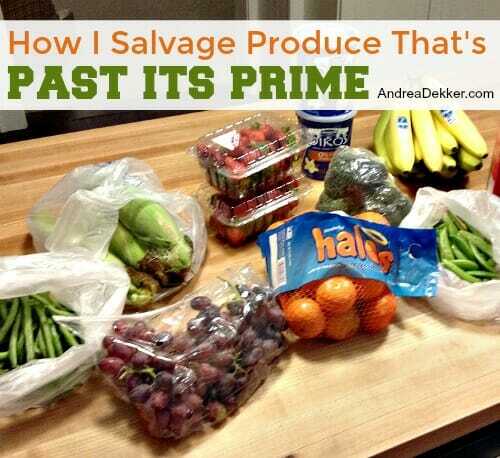 We eat as much as we can fresh, and then I “salvage” the rest. We have bags of discounted berries in our freezer (all washed, sliced, and ready to go). 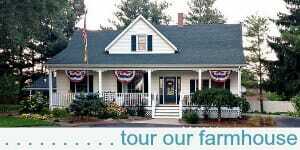 We use blueberries for pancakes and our favorite blueberry muffins, strawberries for pie or shortcake, and a variety of berries for smoothies and berry compote all year long! 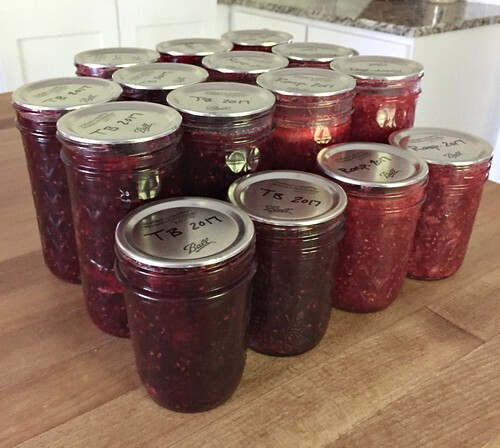 I also freeze chopped rhubarb and cherries in 2-cup containers for breads, muffins, and jam. 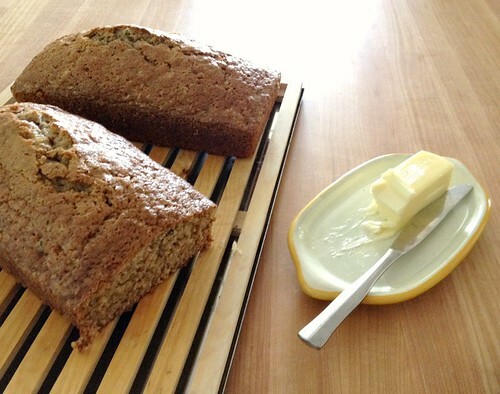 I use frozen and defrosted bananas to make our beloved Banana Chocolate Chip Muffins and Frosted Banana Bars. I do freeze some bananas without the peels and I use those for smoothies or chocolate covered banana popsicles! Also, did you know that you can extend the shelf-life of your bananas by wrapping the stems in plastic wrap?? 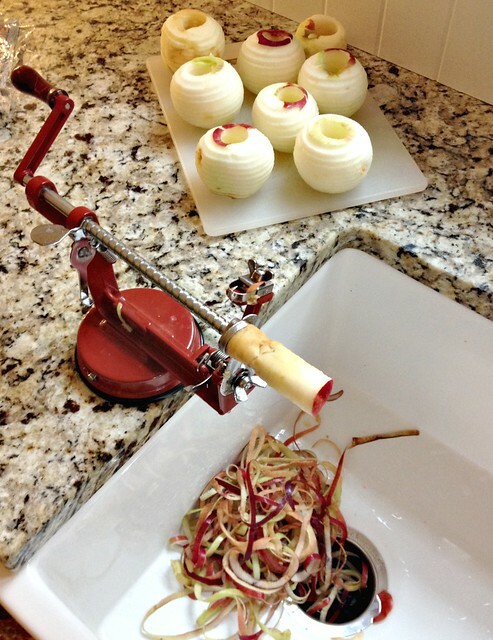 I use my Apple Slicer Peeler Corer to peel and thinly slice apples that are getting just a bit old, mushy, mealy, etc. I put them in freezer bags and use them for apple bread, apple cake, smoothies, etc. You can also cook any bruised or mushy apples to make regular applesauce, our favorite chunky cinnamon applesauce, or apple butter. I’ve been getting most of my peppers from Aldi’s these days — but they are still pricey, so I try to always find them on sale (or on the discount rack). In the past, I’ve gotten 10 huge peppers (yellow, orange, green, and red) for a grand total of $2.10. They were all still nice and crunchy and we ate several of them on salads or raw. I chopped up the rest and put them in a large freezer bag. Now I can simply grab out a handful for omelets, casseroles, soups, or stir-fry. I mix all the colors together, but you could separate them out if you want. I know none of these vegetables are expensive, but I still hate to waste them. So if I see that my carrots, onions, or celery is starting to look a little “old”, I quickly chop up whatever is left in my refrigerator and put them in gallon freezer bags. I lay the bags flat so I can easily break off whatever I need for soups, stews, casseroles, etc. This saves me SOOOO much time later on because I can just grab a handful of chopped veggies from the freezer and keep going with my recipe. 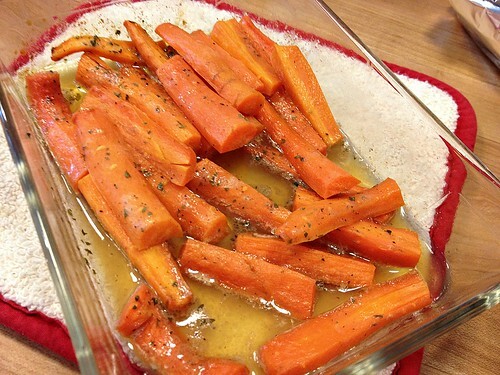 Oh, and this is a great recipe for roasted carrots that I’ll often make if I find a great deal on discounted carrots. Our kids LOVE broccoli — so whenever I find a great deal, I usually just cook it up for dinner that night or use it to make brocoslaw. However, if I have a bunch of it left over, I’ll chop it up for the freezer and use it later for cheese broccoli soup or chicken broccoli rice casserole. I don’t normally freeze potatoes in soups because I haven’t had the best luck with that. However, I DO chop and shred my own potatoes and freeze them for my yummy cheesy hashbrown potatoes or fried potatoes. I don’t do this very often because potatoes have such a long shelf life, but there have been a few occasions when I’ve salvaged the last of my potatoes by tossing them in the freezer! I’ve been freezing zucchini and squash for many years. 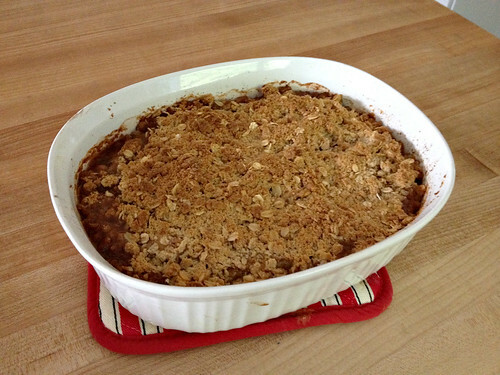 I shred it all in my food processor and freeze it in 2-cup portions for breads, cakes, muffins, and my delicious “apple-less apple crisp”! I grew a BUNCH of summer squash in our garden this year and roasted it all in the oven for about an hour, scooped out the insides, and put it into quart-size freezer bags. I’m planning to use some for various recipes (especially around Thanksgiving) and will use the rest to make baby food for James! UPDATE: We hardly ever let zucchini get old in our house anymore because we make zucchini noodles on a very regular basis! We eat lots of fresh spinach in our salads, but we have to buy very large bags of it, so it often starts to get a bit wilty before we finish a bag. Instead of tossing it, I chop it up and freeze it in 1-cup portions to use in Chicken Lasagna, quiche, and SO many other soups and casseroles. When in doubt, wash your produce, peel/slice/dice it, and put it in the freezer — it’s amazing how many fruits and veggies can be successfully frozen and used up again instead of trashed. 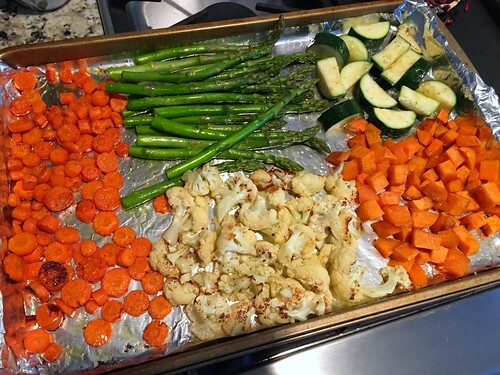 Also, roasting veggies is a fantastic way to use up the ones that are starting to get mushy. Roasted veggies are SUPPOSED to be mushy, so it won’t even matter! You can save almost any vegetable leftovers and use them to make delicious homemade vegetable broth for soups and stews. Similarly, you can use almost any fruit to make smoothies, jam, or fruit compote (which we put on ice cream) — as long as it’s not actually ‘rotten’ but just ‘past its prime a little. The flavors will most likely just be enhanced if the fruit is super ripe! I’ve read statistics that claim Americans waste up to 40% of the food they bring into their homes (yikes!) — and while I certainly hope our family does better than that, I know we still waste some on occasion. The important thing is that we are always trying to waste less — use up leftovers, freeze foods before they go bad, etc. etc. Do you have any other other great tips for salvaging produce? 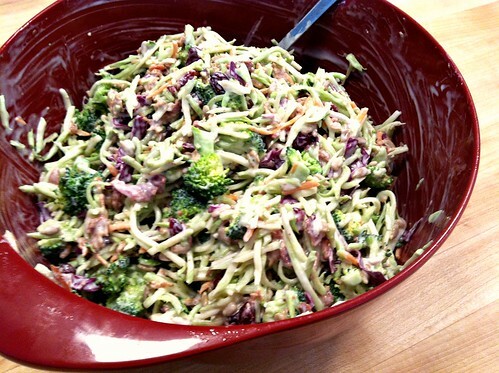 These also make great hashbrowns when shredded! This is a great tip Terri! Thanks! Now I want to make potatoes! I have never seen discount produce racks in my grocery stores. What stores in the Midwest do this? I’ve bought 2nds at the farmer’s market of tomatoes, peppers and fruit. Key is planning to use it immediately or freeze it. Did so for some peach jam and my guy froze the peppers that were more than he needed for the dinnr that night. Surprisingly not much waste. He has an organic garden, so I know he is not dumping toxic chemicals on the produce that I pick there. Grow it yourself is the only way to know for sure. I just wanted to reiterate checking out the dirty dozen site that lists the veggies and fruits that are most heavily sprayed with pesticide. You really can’t just buy non-organic and wash it really well. It’s already inside the fruit/veggies. Even if not for your own health, it can be so worth it for your kids’ health. Fruits and veggies that are organic also need to work harder to survive the elements (survival of the fittest) as they aren’t helped out with any pesticides to keep bugs away so they form their own defenses, which upgrades the nutrition in organic produce. Hope that makes sense! Love all of your tips, Abdrea. 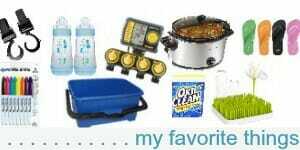 That’s the first place I go at hte store, too, but it’s been slim pickings lately at my Meijer! I end up dicing my peppers and I also make little onion bundles (by dicing a whole bunch at once) so I can toss one bundle in whenever I need peppers That saves me SO much time…and getting my hands dirty with onions every time I need them! Darn! I could’ve used this yesterday when I tossed a bunch of stuff before I went to the store. Thank you! 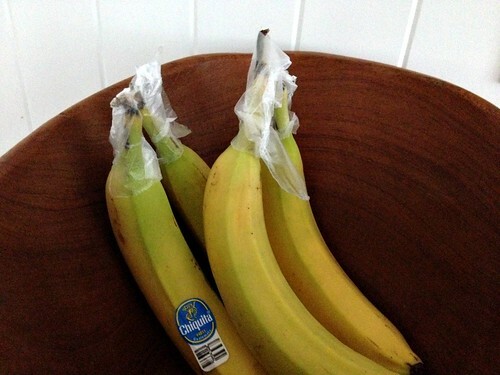 The tip about peeling bananas first is SO obvious, but I recently realized it… Huge time saver! I always walk by the rack that has the produce that’s nearly out the door, and always wonder “What can I make with this! ?” I think i’m going to try this out, and really get going. A lot of the time a few items or areas of the items are starting to get a little fuzzy with mold or other things…can you just cut that bit off and use the rest or is it better to toss the whole item once mold is involved? Sarah, I’d say “it depends”. If there isn’t much mold AND you are going to be cooking the veggies (like in soup or something) then I’d say go for it. If there is a lot of mold, I’d probably just toss them. The idea is that you’d hopefully catch the produce BEFORE it gets moldy and salvage it at that point so it doesn’t get wasted! In AZ, we have a program called Market on the Move. They pick up the produce that stores won’t accept from distributors because it is misshapen, the wrong color, etc. Then, they set up farmers market style events where people can donate $10 to receive up to 60lbs of produce. I already stock up on peppers and berries when they are on sale, but have never been too sure about other items. Thank you for all your tips on freezing (especially your veggie freezing chart). It will get a lot of use in this house! 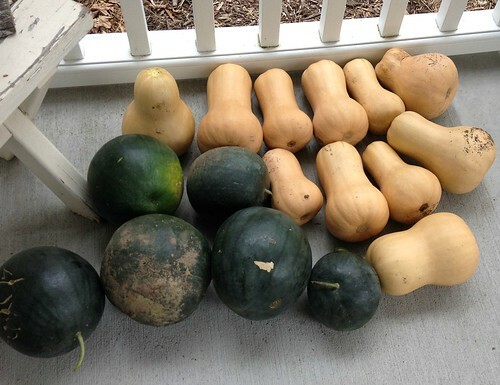 Andrea and friends…..check your markets for reduced priced pumpkins. I picked up huge pumpkins this afternoon for $1.00 each! Pies and pumpkin fries here I come! WHAT are pumpkin fries? I need those in my life. Great tips. Although I have no problem with the reduced bakery, meat and dairy sections…I’ve always been a little squeamish when it comes to the produce. This has definitely changed my attitude! One good tip for potatoes…when they’re starting to go south, I make them into mashed potatoes and freeze them in single serve portions. Then you can just pop it in the microwave with a touch of butter. Heat, Stir well and serve. Also great to use on top of casseroles instead of a pie crust. I took off work today to start tearing out my garden, ended up with 3 big green peppers and lots of other things. I made stuffed green peppers in my pressure cooker, made a roast in my crock pot,and steamed odds and ends of vegetables, and made beef stroganoff–no sour cream added yet, and froze everything. 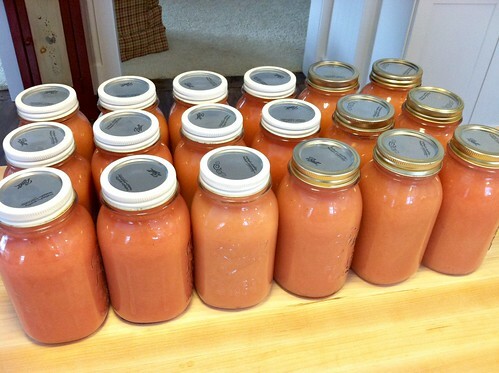 have enough meals frozen now from our garden to get us thru Thanksgiving. I also have in my freezer my “garbage” pail, and in that I dump any left over green beans, corn, anything left over from a meal, a few tablespoons of this and that, any odds and ends of ketsup etc Then when I make soup I dump my garbage pail into the soup the last 20 min. Free meal because the soup is my own stock from a cooked chicken or beef. For the stuffed green peppers I had a few tab of corn left from the summer about a 1/2 cup black beans, etc and threw all that in with the ground beef and rice. And odds ends of chives, from garden, it was so so delicious we split a big one for dinner and I froze 2. Because I work by the time I get to the store all the discount food is long gone. But I have shopped with my sister and she does that and gets great deals. I don’t use coupons, no time and we try to buy organic so that makes our food bills expensive. However cheaper then going out to eat. Made tomatoe soup with odds and ends of tomatoes from our garden. I am cheap. All my food is stored in my freezer in color coded plastic bins and then I keep a feezer inventory and make my weekly menu up from the inventory. Saves a lot of time and money, because on my way home from work I never stop for takeout, our freezer provides that for us. I have not been to grocery stores that sell older produce. I will have to ask the stores what they do with less than perfect food. Veggies and fruit are as expensive for us as meat. We often buy produce at warehouse clubs – these tips will help us not waste any. I live in the Twin Cities are of Minnesota. I too have NEVER seen marked down produce in a grocery store here. Nor do I ever see marked down meat. I sure wish I knew why. Apples can be sliced and sprinkled with cinnamon and/or brown sugar and dehydrated for kid-friendly snacks. You can do the same for bananas. 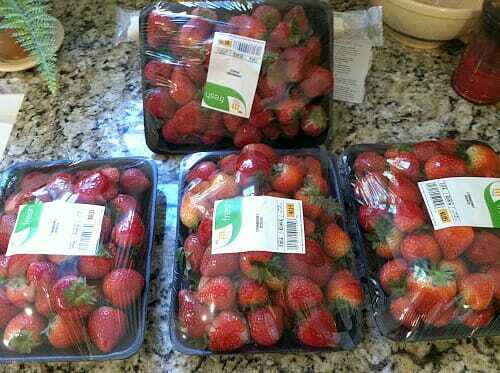 Strawberries can also be dehydrated for future use for cereals, oatmeal, pancakes, etc. When the center of the celery stalks are left and getting a little limp, I chop the celery into one inch pieces and dehydrate thoroughly. I grind the dried celery in the coffee grinder…I now have celery salt to use as seasoning. 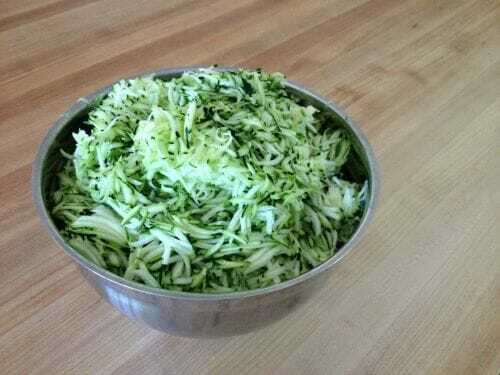 Leftover zucchini can be sliced and seasoned with various seasoning and dehydrated for fantastic chips. We recently upgraded from a cheap dehydrator (did NOT work well) to an Excalibur dehydrator and just love it. Our favorite thing to dehydrate is fresh or frozen spinach! You can dehydrate 2-3 large bags into one pint of green stuff that looks like dried parsley. Then it goes into smoothies, casseroles, soup, eggs, etc. You could probably dehydrate any other greens, too. It’s the easiest way I know to sneak more greens into our diet, since our small children don’t do well with salad and we’re not fond of cooked greens. Another quick tip that works is as soon as you buy produce rinse it with 10 parts water and 1 part Organic Apple Cider Vinegar – don’t worry this will not alter the taste of the produce but it cleans it and can preserve it longer (I use this method with strawberries a lot) and they keep in my fridge much better. I usually just use 10 tbsp of water to 1 tbsp of ACV, there is something in the ACV that prohibits / delays the growth of mold. This is a hot button for me at my house. We waste so much food. Everything from left overs from restaurants to the produce that we just don’t seem to use up. You have motivate me to once again work to get this under control. 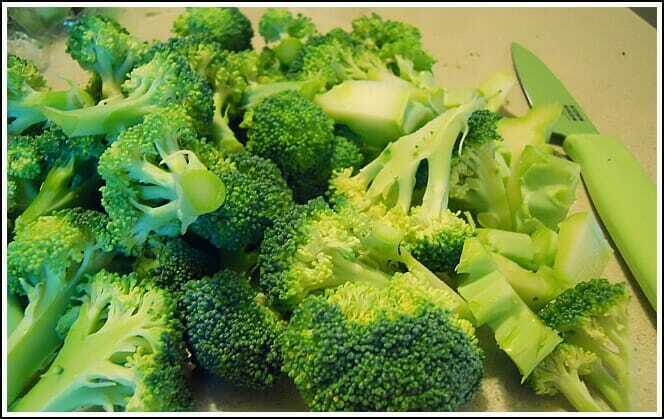 Obviously, freezing produce BEFORE it has lost it’s freshness is a smarter move than tossing it. 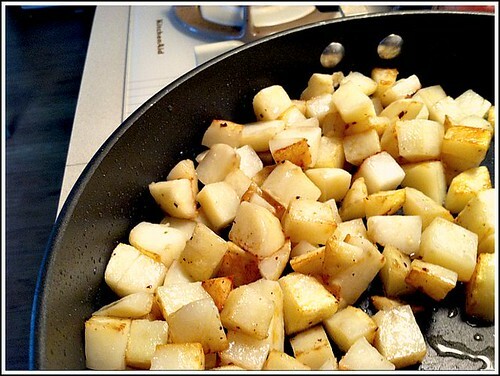 one more tip… I bake a big batch of potatos when i am making baked potatos, then I shread them to make hash browns for breakfast or a quick meal! If we leftovers I then trow them in the freezer. I did most of the other things except the spinach… thanks for the tip! Great post! Thank you for all the tips! 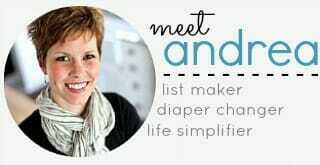 Thanks for some ideas I haven’t thought of before, Andrea! My best long-used idea is to peel and slice the over ripe bananas into gallon bags, shake the bags to even them out, and freeze them flat. Then I can break off a hunk to put on a dish of oatmeal, tput the dish in the microwave for 20 seconds or so, and have pleasingly cold bananas on top of the hot oatmeal. I can buy wrapped packs of 9 or 10 over ripe bananas for $0.50 or so. It’s simple, cheap and yummy! Ooooo… I like that idea of freezing it in muffin cups. I might just have to try that! One question, do you buy organic veggies and fruits because I needn’t notice those ever going on sale. There’s a list of the top ten produce items that they recommend you buy organic because of all the heavy pesticide use and fertilizers that are found on them, I ave a hard time saving any money in the produce section because of buying organic. Anyone else spend a lot on organic produce? Laura, I don’t go out of my way to buy organic — only if it’s on sale or on the discounted rack. Otherwise I just by “regular” produce and wash it. Laura – our family owns a produce company and I can tell you that anything bought in a store labeled organic or not has had some type of pesticide used on it (the USDA requires it, if it will be sold in a grocery store, this does not apply to farmer’s markets). The main difference in buying organic and regular produce is how much it has been washed. So I would recommend saving your money and buying regular fruits/veggies and either peeling, soaking, or washing your produce with soap and water. Actually this isn’t quite true. For a product sold any where, grocery store or farmers market to be labeled USDA organic it must be at least 95% organic. Here’s a link to a USDA website that explains it in more detail. Unfortunately pesticides can’t just be washed off. They become part of the plant as it grows and therefore part of the fruit or veggie that it produces. Some items like apples have more than others so are worth buying organic. Others don’t have much residual pesticides and can be purchased for the best price without concern. If you do a search for Dirty Dozen you can find a quick shoppers guide that will give you a list of the worst offenders. Yes!! I will only buy organic. Sometimes it is limiting from both the availability (small town market has not a lot of fresh organic) and the price. I try to stock up on frozen organic fruit & veggies as a great backup/cost savings. But some things I just cannot find organic at a reasonable price here. 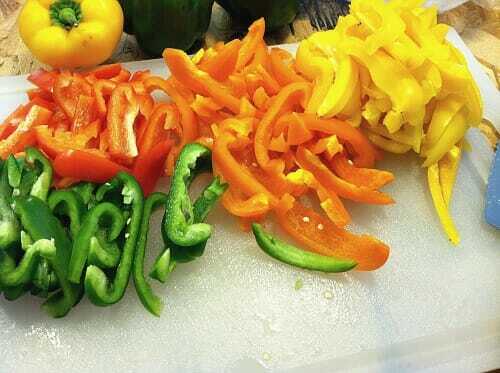 Organic peppers are $2.29/each. Cauliflower is $3.99 for a tiny head. I still think it’s 100% worth it from a health standpoint even if it means tweaking the budget elsewhere. I know not everyone has room to tweak though. I do the very same, Andrea. I use oranges that are discounted for sauces as well as an acid for dressings, etc. Cucumbers, green tomatoes, onions, they can all be “quick pickled” as well. 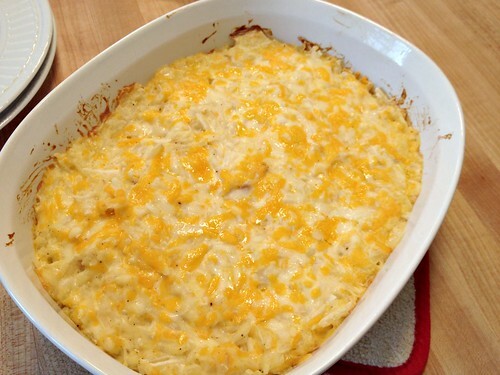 You can make a quick side dish this way. Here is another hint. I take qt size containers or bags, and place peels, ends, etc in that, I freeze them. Then I make veggie stock out of those, adding bay leaf, peppercorns, salt, and spices. Then I have broth for soups, stews, and liquids needed for cooking. After the broth is made, don’t throw them out, compost them! The point is to use what we have to its absolute fullest! Mushrooms can be done the same way too. Thanks Monica — I often make my own broth too so I’ll have to start saving my peels and such. Do you make raspberry bread? I checked your recipes and I don’t find it listed. I have a question regarding freezing strawberries (since I’ve never done it before) – after you wash them, do you let them dry before freezing them or can you put them into the freezer while they’re wet or damp? I just pat them dry – they are not absolutely dry like from the store. I usually freeze them whole as I use them in smoothies. But I dry them in a single layer on a cookie sheet and then put them in ziploc baggies so I can take out as much as I need without having to deal with a solid clump. 🙂 Depending on what you want to use them for, I am not sure it matters if they are still wet or not. I don’t let them dry… I just try to freeze them flat so they don’t all clump together. It’s worked for me so far! Andrea, you never fail to inspire me. Thanks so much for your tips!